A drawing salve is a homemade preparation that you apply to splinters, boils or insect bites. I have family members who live in rural areas and chop wood for their fireplaces. Despite wearing gloves, they end up with a lot of splinters. They use black drawing salve and it works! One cousin said she remembered our great Grandmother making drawing salve on the farm in Wisconsin. So drawing salves have been around for quite some time. 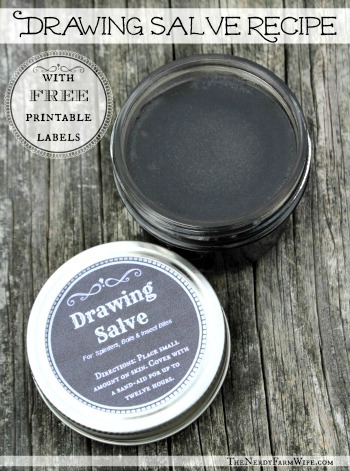 Jan (NerdyFarmWife) shares her recipe for drawing salve. It uses an infused oil (which she explains how to make), activated charcoal, and other ingredients. Click the Homemade Drawing Salve Recipe link below to see Jan’s recipe.